What’s a Dad Want on Father’s Day? I’m a new dad. Well, not that new. And I’m not sure if you’ve noticed, but the role of the dad has changed over the years. Remember Ward Cleaver? Nowadays any man who comes home to sit in his chair and read the paper while mom (who has been working hard by herself all day) continues to handle the kids and make dinner is due for a well-deserved rebuke! Now I know it wasn’t all like that in the old days—that’s oversimplified. But the game has still changed. You can’t deny that. Men—real men!—are in the thick of it. Being a dad to young kids is great. I can’t explain it fully. It involves reading lots of stories (often the same one over and over, I might add), middle of the night wake-ups to calm from bad dreams, changing dirty diapers, patching up skinned knees, trying to balance work with home, making your marriage a priority, being an example, teaching your kids to pray, listening and more listening, being man enough to wear pink princess hair clips, having the patience to answer the same question 15 times, and trying to be a rock for both wife and kids. And that’s just the tip of the iceberg. Being a dad is important. There’s an old saying that having a child doesn’t make you a dad. That makes you biologically able to reproduce. I fear that in the busyness and confusion of our times, fatherhood may be a dying art. I hope not. 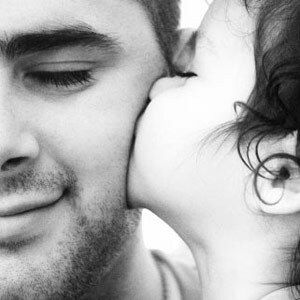 So it’s important to acknowledge, however modestly, that intentional fatherhood is at the centre of a healthy home. But back to my point: So what do (fairly new) fathers want for Father’s Day? I can’t really speak for others, but personally I really just want to be with my family. At this phase in my life it’s tempting to want to take some “time away” because things can get so exhausting. A few hours would be nice. But I wouldn’t want to be away for too long. I want to be in the chaotic mix of it all. I want to play princesses and pirates and maybe get a nice card with some stickers on it. In the morning, maybe a hot coffee and a pat on the back to say that you’re doing all right. Previous Post: What if God is Asking US for a Sign? When I was a little girl I thought Ward Cleaver was mean. When I became a parent I knew then Ward wasn’t that way at all he loved his boys, he was teaching them the right thing to do at the time .